With the Oscars and all their shiny predecessors behind us for another year, it’s time to sign off on awards season and move on to something, anything, more interesting. But before we say goodbye, a quick minute for reflection: What would you do to improve awards season, whether that means fixes to an individual awards show, the way the media covers it, the people chosen to host it, or any other aspect of the phenomenon? Much like with election season, I wish the whole process could be shortened so it doesn’t drag on so—I wish we learned about the Grammy and Oscar nominees a week at most before the ceremonies, for instance, so we wouldn’t be subject to a month of analysis and chatter and second-guessing and industry lobbying and annoying ads. But that wouldn’t really serve the albums and artists and films in question particularly well: The gap between the nominees being released and the awards shows are a big financial boom for anything nominated, and people who aren’t jaded critics need the extra time to catch up on the nominees. So that’s just a selfish, idle wish on my part. Equally unlikely, since there’s no way to make it a rule and I’m just asking the universe to alter human nature: I wish there was a way to ensure no legacy awards, such that a given artist wins an award only for the film or album or performance from that year, rather than because they’ve been passed up too many times in the past and it’s so unfair, or because they didn’t win for that one film they probably should have won for a decade ago, or whatever. It always steams me to see a really good nominee passed up in favor of a so-so one solely in order to rectify old wrongs. I’m writing this the Thursday before the Oscars, so I don’t know if they’re going to continue it this year, but I could really do without the long individual introductions to the nominees, you know, the ones where a bunch of ladies who maybe worked with a given Best Actor nominee once stand around and talk about how handsome, strong, and talented he is? I already resent being “made” to stay up late on a Sunday night, and this not only prolongs the program, it turns the Oscars into more of a circle-jerk than it already is. When will these people realize that we don’t care what they say on the awards shows? Just show up, collect your shiny thing, and turn around so we can see what you’re wearing. Except for Hugh Jackman: I wouldn’t mind seeing more of him at the Oscars. Or any other awards ceremony. This is a pet peeve (one Noel and Scott addressed in a Crosstalk a few years ago), but Oscar bloggers need to seriously chill out, sit down, and shut up. This inane industry has been allowed to proliferate way, way too long, when basically all it is a bunch of dudes (and women; gender parity for worthless activities is here!) trying to predict what will happen when voters vote. In the lead-up to all this suspense, they have many tricks: They can interview “people they know” in the Academy, they can “follow trends,” they can monitor the awards leading up to the Oscars, and pour out torrents and torrents of words about nothing. Cultural writing doesn’t get more default ephemeral, but it’s the self-seriousness of the enterprise that kills me. At least the Grammys don’t have Grammy bloggers excitedly monitoring the voting body while speculating whether Eminem or The Arcade Fire will come out on top. Just watch the show. Short of nuking the Kodak Theatre—a tempting proposition—why not reveal the Oscar race for the irrevocably tainted circus that it is? No more campaigning behind closed doors, no more promotional events disguised as special screenings or luncheons. If Colin Firth thinks he should beat Jesse Eisenberg, let him step up and say so. I can see the campaign ads now. Imagine a montage pairing Vincent Cassel’s criticism of the gelid perfection of Natalie Portman’s Black Swan character with the chilliest, least affecting moments in her filmography, or a few terse seconds isolating the most comically overplayed moments of Melissa Leo’s Fighter dumbshow. Better yet, publish the vote totals, so we know just how close (or not) the races are. The argument is that revealing that a winner squeaked by with a small percentage of the vote would weaken the Oscars’ credibility, but as far as I’m concerned, they don’t have any to start. I would love to see comedians get more involved with awards shows, even if only in a behind-the-scenes capacity. The Academy Awards, in particular, are always ridiculously stuffy, and I feel like with the right comic sensibility, they could be a fun exercise in gently ribbing Hollywood while still making the elite feel like they’re a part of something special. Hire more stand-ups as writers. Put bigger comics on stage as presenters who are more willing to go off-the-cuff. Hire up-and-comers to make a web series that can air, in parts, during the ceremony. If these efforts make the awards half as fun as Tropic Thunder, we’re in for a treat. Even though I benefit directly from the awards-season hoopla in the form of all the “for your consideration” screeners that start rolling in around the end of October, I’d be perfectly happy to see all the pre-Oscar awards disappear. By this, I mean no more critics-organization awards (a few of which I vote in), and no more trade-organization awards like the PGA, DGA, SAG, and so on. I’d love to start working on my best-of-the-year list over the Christmas holidays, when I actually have time to watch movies and think about them, and I’d love to look forward to the Oscars as an event unto itself, instead of as the finish line to three months of the same people giving the same acceptance speeches over and over. Every year, we slog through endless orgies of self-congratulation and self-love in hopes of stumbling across a moment of spontaneity when someone (usually Kanye West) goes off-script and makes things weird and neat and electric for a brief moment. Then we go back to being bored out of our skulls. My suggestion for improving all awards shows is give them over to the freaks. 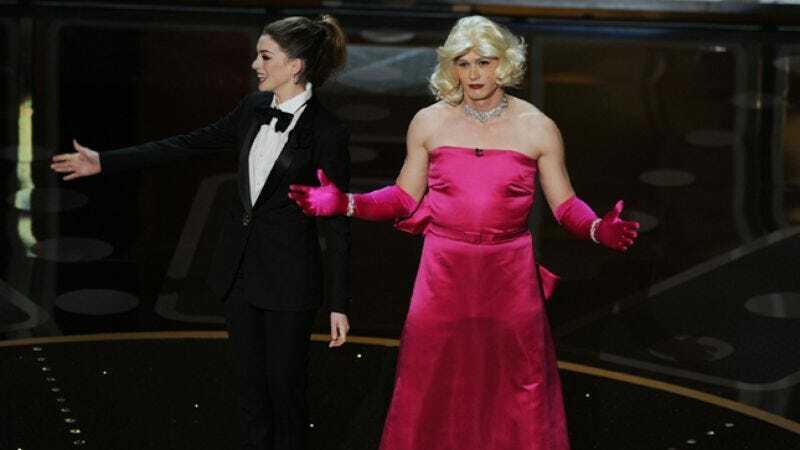 Invite Soy Bomb onstage to present Best Picture. Have Kanye West onstage the entire night to tell the audience who he thinks should have won a given award. Make Sacheen Littlefeather accept everyone’s awards. Have Tim Robbins and Susan Sarandon reunite solely for the sake of making a shrill, long-winded political speech. Give in to the madness! I, unlike most of my colleagues, love the ridiculousness of Oscar season. In particular, I kind of love when the wrong person wins, so the Internet goes a little nuts. I mean, yeah, Crash shouldn’t have won, but the ensuing outrage was alternately fun to take part in and completely ridiculous. To that end, then, I would like Oscar to release the vote totals, preferably retroactively. It would be a wonderful way to go through years of Oscar history and see just how little of a clue the Academy has on many occasions. Sure, Citizen Kane was nominated, but what if it came in last that year? And what if The Blind Side came in second last year? So many possibilities for mocking the idiocy of a bunch of random people and celebrities! And if they wanted to release the vote totals for the nominations period as well, as a data freak, I certainly wouldn’t complain. I’ll bet Tremors was this close to a Best Picture nomination! Let’s be honest, guys: Isn’t the appeal of award shows rooted directly in what we all profess to loathe about them? When I was covering the Grammys for The A.V. Club a few weeks ago, I was amazed by how many people were watching the show just so they could talk on Twitter about how much they hated it. If the Grammys were somehow appreciably “better” by whatever standard you wish to measure award-show goodness, I’m not sure they would be nearly as much fun. That’s because awards shows are not about art. I mean, duh! They’re supposed to be garish, bloated, tacky, and tasteless, because that’s what makes them fun to talk about. If they weren’t all those things, we’d all be stuck trying to figure out how a particular piece of art can be objectively “better” than another piece of art. Who wants more of that? Award shows are a masturbatory institution perpetrating masturbation; if they don’t get off, we don’t get off. So I say don’t change a thing. I see Steve Hyden’s stay-the-course call and raise him: make them worse. Yes, Arcade Fire won this year, and the David of The Hurt Locker beat out the Goliath of Avatar last year. But these are the exceptions that give awards shows a veneer of legitimacy they don’t deserve. Let’s just hand awards out willy-nilly, since most of the time, it seems like that’s what’s done anyway. “And the award for best original screenplay goes to… You Again, written by Moe Jeline.” We’d all have something to complain about, and nobody would think it meant anything at all.